Steve Mason's fourth solo studio album, his first since 2016's 'Meet The Humans', sees him continue to change things up ever so slightly with each release. In a more collaborative move, including contributions along the way from his live band, Steve Mason, along with producer Stephen Street, has given us his most 'open' and accessible album to date. It's almost like he's found a way to express himself without restraint; that he's become unburdened and been allowed to just be. 'About The Light' is an assured album from a seemingly confident and content artist in his prime. 'America Is Your Boyfriend' ushers in the album with warped brass and an interesting percussive arrangement that starts modestly enough before breaking into a fully-formed, all guns blazing, chorus of epic and anthemic proportions. The song swings between the two contrasting scores with more horns and layered harmonies as Mason and his band help the track take flight and soar. 'Stars Around My Heart', the first single lifted from the album, is where Steve's ethos for the album is realised completely. There's a big up-front brass section, a great backing vocal accompaniment and a radio-friendly immediacy (not least because it mentions the radio in its chorus) that is nigh on impossible to resist. It's proper Pop with a soulful panache. 'Spanish Brigade' goes similarly large with its epic scale and vast, expansive sound. There is nothing claustrophobic, limiting or withdrawn about any of these big album tracks, including the raucous and upbeat 'Walking Away From Love', and nor should there be. They're unapologetically loud and proud. The album's title track brings piano and steel guitar to the fray as Mason mixes a fusion of styles to deliver an individual, captivating and at times mesmeric song. The looping chords, female backing vocal, contrasting voices and storyline all combine to give up a gem of a track. 'Rocket' slows the pace as Mason flexes his vocal range to give a falsetto feel to the reflective track. His lyrics, the vocal tone, even some of the lyrical content and the production gives it an almost Elbow-like quality to begin with before the song breaks in the latter half to reveal a wider musical soundscape of unrestrained positivity and freedom. 'Fox On The Rooftop', slap bang in the middle of the album, is where Steve appears to give us an unassuming piece that slots in effortlessly to the ten track set but it's so much more than that. FOTR is a somewhat unexpected album highlight (unexpected as it's not been featured as a pre-release track). The sumptuous score evokes elements of 'Wish You Were Here' throughout the song with Steve's gentle vocal arrangement adding to the Floyd feel. The revolving percussion, intermittent triangle and acoustic guitars all add to the dreamy, engaging nature of the song. 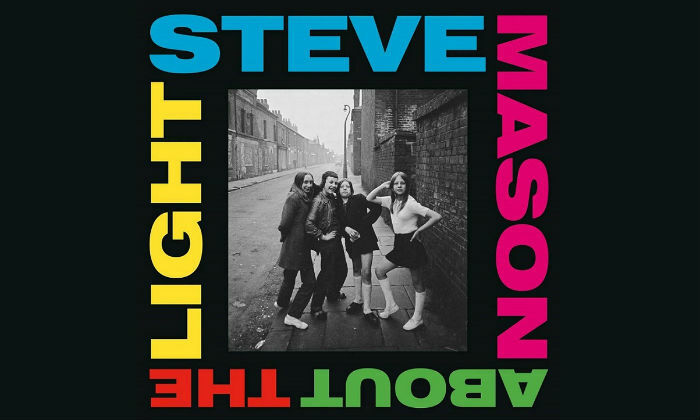 'About The Light' bodes well for the string of new albums set for release early in 2019 but it also heralds a new chapter for Steve Mason. With his latest release, his want and drive for to "achieve greatness" by pushing himself "out of his comfort zone" he has offered up his best solo album to date; one which should bring him a wider audience and an ever raised public profile so that his music can be enjoyed by many more than just his current core fan base.